Will a festival from South Cotabato emerge as Aliwan Fiesta winner this year and come home with the P1 million grand prize? This isn't far as popular festivals from the province of South Cotabato will compete in the upcoming Aliwan Fiesta 2012. These are the T'nalak Festival of the province of South Cotabato, Lembohung Festival of the Municipality of Surallah, South Cotabato and the Kalilangan Festival of General Santos City. The T'nalak Festival of South Cotabato will be represented in the Aliwan Fiesta 2012 by last year's T'nalak Festival's Kadsagayan A Lalan champion from Notre Dame of Sto. Niño. This group from the municipality of Sto. Niño was also grand champion in the street dancing competition of Koronadal City's Hinugyaw Festival 2012 held last January. Last year's Aliwan Fiesta 3rd Placer- the Purok Sison Elementary School Performing Arts Group will once again compete with the other 20 festivals/contingents from all over the country. 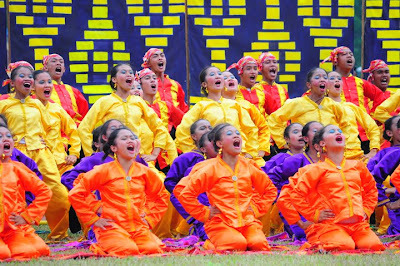 Purok Sison Elementary School, the three-time Kadayawan Festival of Davao grand champion will be representing Lembohung Festival of Surallah, South Cotabato. Below is the list of contingents for the Aliwan Fiesta 2012 this coming April 14, 2012 at the Aliw Theater in Pasay City.